Posted by Shane Ryans on January 16, 2013. No matter your business or industry, raising click-through rates for your Google Ads is always a top, ongoing priority for any pay per click expert performing PPC management services for a company. There are innumerable methods and suggestions for improving CTRs, but not all can be guaranteed to work for everyone all of the time. However, we regularly practice the methods below, and these tips have worked for us the vast majority of the time. Try incorporating them into your next pay per click campaign! 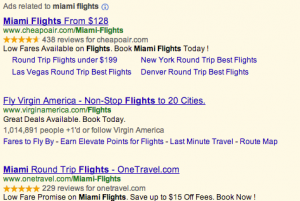 An easy way to increase CTR that also boosts conversion rates is to use ad extensions. 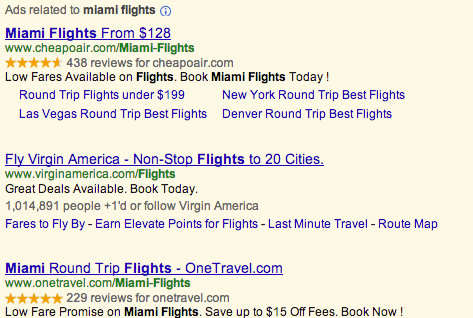 Ad extensions give potential customers more reasons to click your ad, and also take up more real estate on the page. Ad extensions can be your business’ address & phone number, links to key products or services or other relevant information. Although this is another type of ad extension, the difference with a sitelink extension is that it allows you to show sitelinks along with another extension. You can include additional benefits or navigation into your website directly from the ad copy. The first ad has a shorter headline than the other two. Adding a period or exclamation point after their headline would automatically extend it. Have some useful advice for increasing your CTR? Let us know!